"Available in a range of enticing flavors: salmon, lamb, wild boar, roasted duck, and a venison and bison mix." "Since meat is the main ingredient, it’s great for your dog’s muscle health." "Features formulas specifically designed for large breeds, with glucosamine and chondroitin added to the recipe to promote joint health." "A great source of the vitamins and nutrients your little one needs to stay healthy." "Features a low-calorie combination of protein and fiber—like chicken, brown rice and sweet potato." "The inclusion of Omega 3 and 6 fatty acids promotes clear, itch-free skin and a lustrous coat." "Proteins are 'whole,' rather than the meat meals used in some brands, which makes them easier for dogs to digest." "Simply crumble a bit of the topper over their regular food, and there’s a strong chance your dog will excitedly chow down." "Just as enticing as the biscuits of old but feature a healthy blend of limited ingredients that are perfect for pups with food sensitivities." Like other types of dog foods, grain-free products come in both wet and dry varieties. Our pick for the latter comes from Taste of the Wild, which is available in a range of enticing flavors: salmon, lamb, wild boar, roasted duck, and a venison and bison mix. Made with real roasted meat and vegetables like sweet potatoes and peas, it’s packed with nutrients and highly digestible. The food features recipes for both puppies and adults and can be purchased in up to 30-pound bags (the smallest is five pounds). Customers rave about the healthy ingredients and add that their dogs think it’s a treat rather than dinner. If your dog’s accustomed to eating wet food, there’s a grain-free option for him too. We love Purina Grain-Free dog food, which comes in a wide range of flavors featuring high-quality meats and real vegetables. It’s also free of artificial flavors and preservatives as well as poultry by-products—and since meat is the main ingredient, it’s great for your dog’s muscle health. The food is available in packs of 12, in either 12.5 or 13 oz cans. Customers rave about Purina’s grain-free wet food for different reasons—some say it’s great for pups suffering from corn and wheat allergies, while others say it’s done wonders for dogs with missing teeth or sensitivities to dry foods. Bigger dogs have different needs from their tiny and mid-sized brethren. When purchasing a grain-free dog food for your plus-sized pup, look for one like Blue Buffalo’s Wilderness brand. It features formulas specifically designed for large breeds, with glucosamine and chondroitin added to the recipe to promote joint health. It’s free of corn, wheat, and soy as well as poultry by-products, and is sold in bags weighing up to 24 pounds. Customers say their large breeds prefer this grain-free option to standard dog foods, and the high protein can reduce the upset stomachs they’ve seen with other brands. Others say it’s reduced the itchiness and dry skin caused by certain food allergies. For small breeds, we love Nature’s Recipe’s grain-free offering. It’s made with high-quality chicken to promote muscle health, and also includes sweet potato and pumpkin for an added dose of energy. 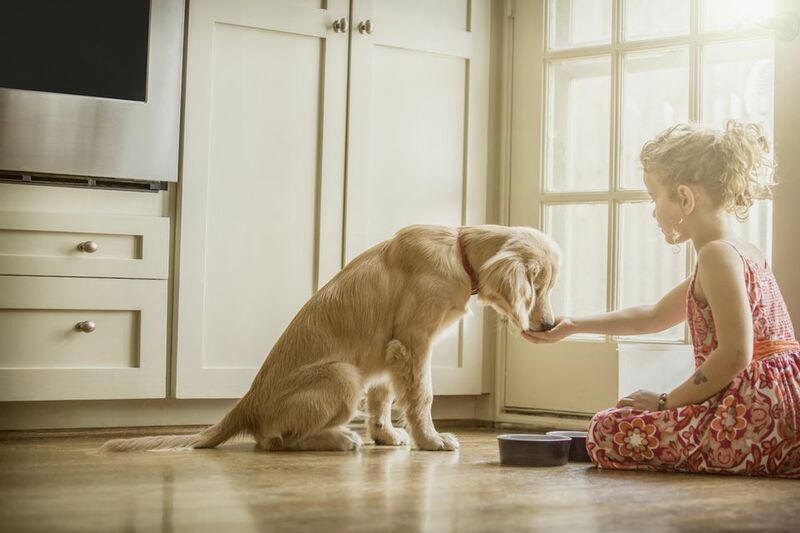 Formulated for dogs under 25 pounds, it’s a great source of the vitamins and nutrients your little one needs to stay healthy—with a grain-free recipe that’s easy on the stomach. Like our pick for large breeds, this food is also sold in bags weighing up to 24 pounds. This small-sized kibble (made with tinier mouths in mind) earns positive reviews from customers, who say the recipe has reduced the issues with digestion their small dogs have experienced eating other brands. If your dog’s been putting on the pounds lately, try putting them on a healthy food that’s designed for weight management. Nutro Lite features a low-calorie combination of protein and fiber—like chicken, brown rice and sweet potato—intended to help dogs lose weight in a safe, healthy manner. It’s also recommended for dogs with diabetes and is available in both large- and small-breed varieties. Look for it in either four or 30-pound bags. And if you pair Nutro Lite with regular exercise, you should see the results in your pup. Did you know a grain-free diet can also help with skin and coat issues? We love Iams’ PrOactive recipe for sensitive skin, which is made with a grain-free blend of meat (either chicken or salmon), vegetables and fruit. The inclusion of Omega 3 and 6 fatty acids promotes clear, itch-free skin and a lustrous coat, while the protein in the recipe builds muscle without troubling the digestive system. Bags are available in sizes weighing 4.4, 10.3, or 19-pounds. Customers say their dogs enjoy this recipe and have seen results fighting issues like tear stains and hot spots. If you’ve noticed a connection between your dog’s diet and skin irritation, Iams ProActive is a great bet. Senior dogs have different needs from younger ones. Halo’s grain-free offering is made with lower calories and fat than other varieties to make up for the reduced activity and lower metabolism that’s normal in older dogs. It also features real meat, poultry and fish and non-GMO fruits and vegetables. One key factor is that the proteins are “whole,” rather than the meat meals used in some brands, which makes them easier for dogs to digest and increases the amount of nutrition that’s retained and utilized. The brand’s slogan is “the proof is in the poop,” and it’s not wrong. When your dog uses more nutrients in their diet, there’s less to pick up as waste. It’s sold in either four or 10-pound bags. Customers say they’ve had great results putting their senior dogs on Halo Holistic Grain-Free food, saying it’s helped them maintain a healthy weight and is free of some of the undesired ingredients present in some brands of dog food. Think raw diets are just for humans? Think again. Unsurprisingly, raw foods are far less processed than other varieties and can come with benefits for gut health, blood sugar levels and more. This offering from Nature’s Variety is used as a topper with regular kibble, making it a great way to add nutrition to your dog’s diet. It’s made with 100% raw ingredients, including freeze-dried chicken, beef, or turkey and non-GMO fruits and vegetables, and is completely grain-free. The topper is sold in various sizes​ but is recommended as an addition to your pet’s dry food rather than a meal in itself. It’s also great for fussy eaters. Simply crumble a bit of the topper over their regular food, and there’s a strong chance your dog will excitedly chow down. Customers also use them to assist with training, since it’s a healthier option than many treats—but dogs love it just as much. And since the raw meat is freeze-dried, you don’t have to worry about any questionable smells coming off on your hands. Customers say their dogs go crazy for these grain-free treats and have noted fewer belly issues (and a lot less gas) since making the switch. For dogs who suffer from allergies, limited-ingredient treats like Natural Balance (where the first ingredient is meat) also help combat the skin and coat issues some pups struggle with.